NEXBOX A95X is an Android TV box that first launched with Amlogic S905 processor, the company thought it was a good idea to make multiple models with the same name with a combination of memory capacity (1 or 2GB), storage capacity (8 or 16GB), and even processor, as you may get a box with Amlogic S905, or Amlogic S905X processor adding 4K VP9 and HDR support. So you should be careful befoire your place an order, and check you got the right model when you receive it. The company now sent me their “high-end” A95X Android 6.0 model with Amlogic S905X processor, 2GB RAM, and 16GB storage, as well as Fast Ethernet and dual band WiFi 802.11 b/g/n support. In the first part of the review I’ll check out the hardware, including the board itself, before testing the firmware in more details in the second part. The box ships in the black package with no apparent trademarked logos or names. You can double-checked the main specifications on the bottom of the package, and you’ll also notice the CE / FCC / RoHS markings which could matter when you import the device. 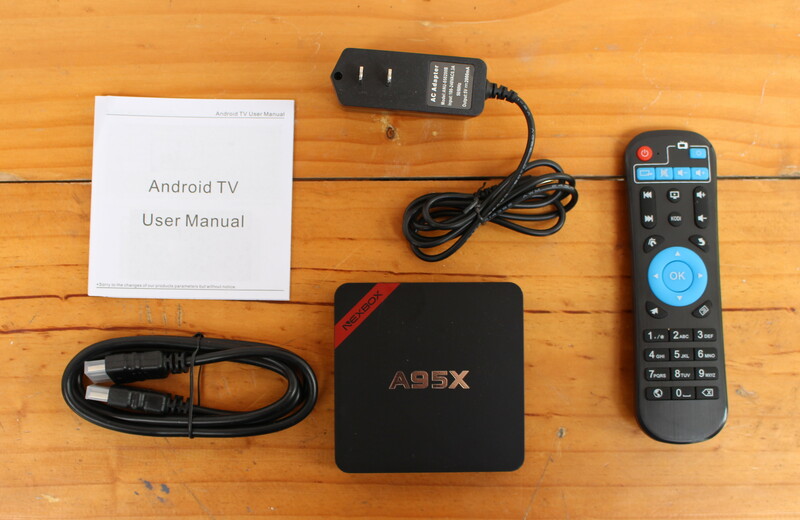 The TV box ships with an IR remote control taking two AAA batteries and supporting IR learning function for 5 keys, a 5V/2A power supply, an HDMI cable, and “Android TV User Manual”. The device itself is really small, although not quite as tiny as WeTek Hub. 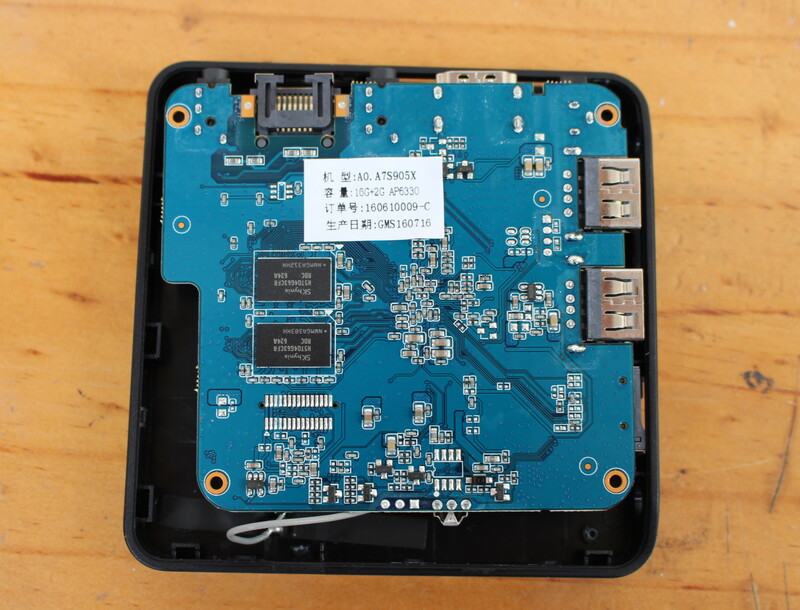 We have a micro SD slot and two USB 2.0 ports on one side, and the power jack, HDMI 2.0 and AV outputs, Ethernet, and coaxial S/PDIF on the rear panel. The bottom of the case list the main specs, and shows a MAC address starting with C4:4E:21, which looks up to… nothing. So either the MAC address space has been recently registered, or it’s just been (semi-)randomly selected…. Let’s open the thing. There aren’t any screws, but you’ll notice a tiny opening on the top center, and that’s where you’ll want to start working your way to open the case. Thermal design looks decent with an heatsink on top of the Amlogic processor, itself in contact with a thermal pad connected to a thick metal plate. 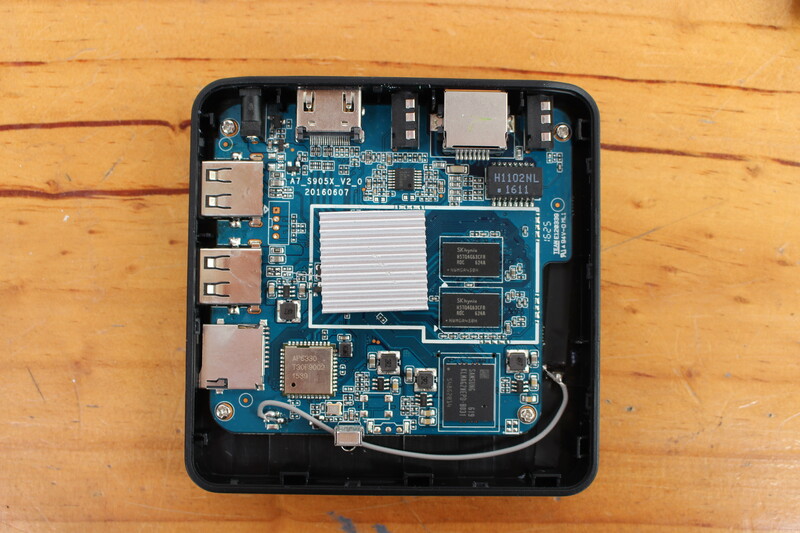 The board is named A7_S905X_v2.0, and includes two SKhynix H5TQ4G63CFR DDR3 SDRAM (1GB), a 16GB Samsung KLMAG2WEPD-B031 eMMC 5.0 flash, Ampak AP6330 module for dual band WiFi and Bluetooth 4.0, as well as H1102NL Fast Ethernet magnetics (The Ethernet transceiver is built-in S905X processor). There’s also a smaller “DID2133 16-12 F1” IC close the AV jack that should be an amplifier. The serial console should be accessible via the four pins close to the two USB ports. Loosening four screws will allow you to completely remove the board, and check out the back where we’ll find two more RAM chips bringing the total to 2GB, as well as sticker with board name, storage/memory/wifi module, a serial number, and the manufacturing date. The board is basically fresh from the oven, as it was made on July 16th, 2016. 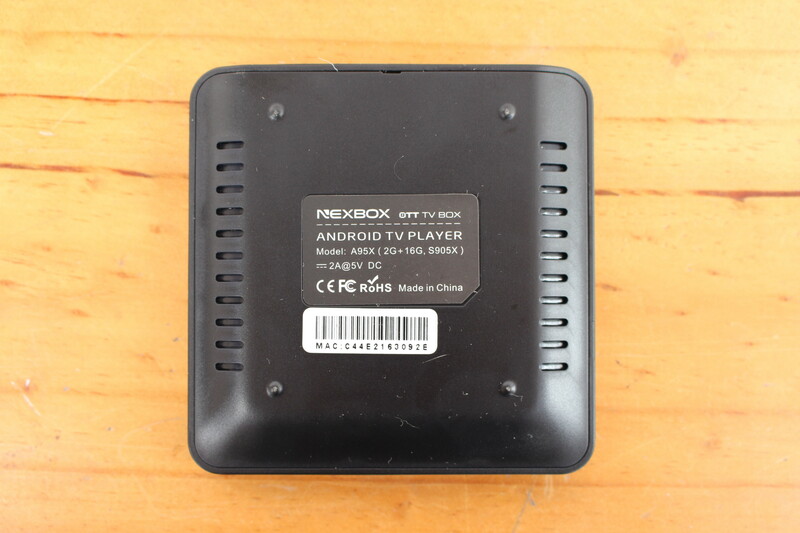 I’d like to thank NEXBOX for sending the device for review, and if you are interested in purchasing in quantity, you can contact them via their website. NEXBOX A95X featured in this post (S905X, 2GB RAM, 16GB flash) is sold for $43.99 on Banggood (group buy), and $51.32 on GearBest. You’ll also find a cheaper (~$43) version with just 8GB flash on both sites, and on GeekBuying. Finally, if you don’t care about VP9, and HDR, the first NEXBOX A95 model with Amlogic S905 processor sells for as low as $23 with 1GB RAM. 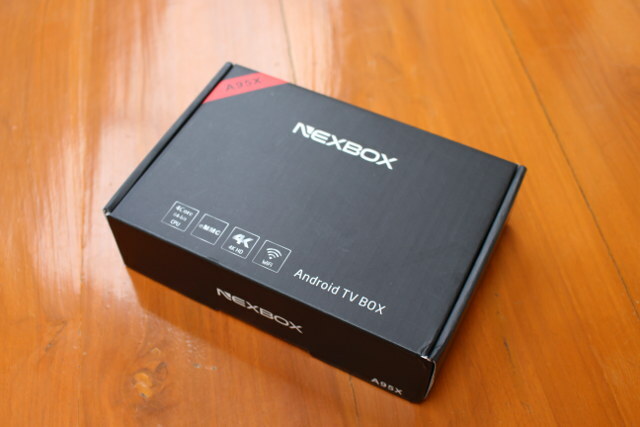 Update: I’ve now completed testing and the second part of NEXBOX A95X (S905X) review is up. False advertising as usual with most S905X. @cnx … I’m looking forward to a description by you how to install debian/ubuntu or another Linux on it! Maybe you can search for balbes comments here or in Freaktab, as I think he’s installed Ubuntu on S905 devices already. humm interesting, they somehow sent you a box with the full heatsink design, i’m wondering why.. I can’t imagine S905 and S905X TPD are so different that S905X cooling has to be double or triple the one of an S905. Did you open your A95X S905 box ? That whole padding on top (or bottom actually) of heatsink idea still looks ridiculous, not the first time i see that though, and on another box i got the same design with no padding between the heatsink and metal plate. Anyways it could give ideas to A95X S905 owners how to fix their “half heatsink” problem. But you’ll still have to put your box upside down if you’re hoping to get some decent colling otherwise your bottom plate will simply send the heat back to the main board on top of it. I don’t own A95X (S905). I think the thermal pad should conduct some heat to the top/bottom plate. If there’s no padding then it’s completely useless. 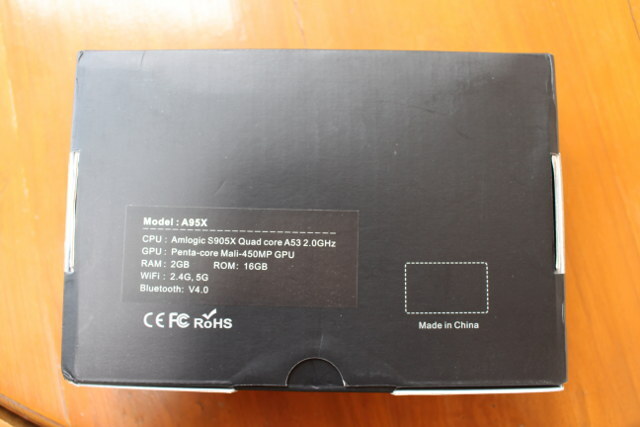 Amlogic S905X specs say it can be pushed to 2.0 GHz (Nexbox showed an extract), so maybe that’s why. I’ll see when I start it. The serial console should be accessible via the four pins close to the two USB ports. if it’s the same as on my A95X (905) then that 4 pin header (the only one i could find on that tiny board) is indeed the serial port which i tested here. Not populated with pins but nothing basic soldering skills can’t fix. The heat sink setup makes no sense. It looks like only the top of the fins are touching the thermal paste, which is going to minimize the contact area. They’d be much better off putting a smaller block of aluminum that covered that just covered the heat spreader on the chip and made full contact with the heatsink on the case. Where is the reset switch? I don’t see anything on the PCB behind the AV connector. You see there? Yes, it gets very hot. I don’t mind using it upside down. Can you advice me? Is it possible to replace with a bigger heatsink and cut hole on the bottom case? I opened up my unit and found that it has 1 GB of DDR4 memory, so looks like they are transitioning to faster memory. Anyone know how to determine memory clock speed? I am trying to hook up the box to my tv and am not able to get a response from the remote to the tv. My WIFI is on so what is still needed to be done? I can not find information to see if I am missing something. Or did not place the cord in the correct spot as there are 3 ports. Is the box running, i.e. you see the Android launcher, but you can’t just use the IR remote control? In that case, check the batteries in the remote control, and make sure the box is oriented properly so that it will get the signal from the remote control. Takes a few seconds to power up on first start. Look for the blue LED light (on the front of the box) that shows it’s on. It’s easy to turn it off if it doesn’t seem to be doing anything. The blue lite comes on and have unplugged the unit to make sure it can reboot, changed batteries in remote and yet they will not connect. I am so tired of watching videos to try to get this thing to work. The remote will not connect. Replaced batteries, plugged in box, turned off and rebooted box yet nothing happens. The remote will not connect. I see the blue lite and the remote just has the flashing red. I waited until it stopped flashing then tried to connect yet nothing. Are you using the TV remote or the TV box remote? You seem to indicate you are using your TV remote. Are you getting anything at all on the TV screen? And are you using the HDMI cable or are you trying to use the AV cable. Just FYI, the AV ports don’t usually work on these boxes.